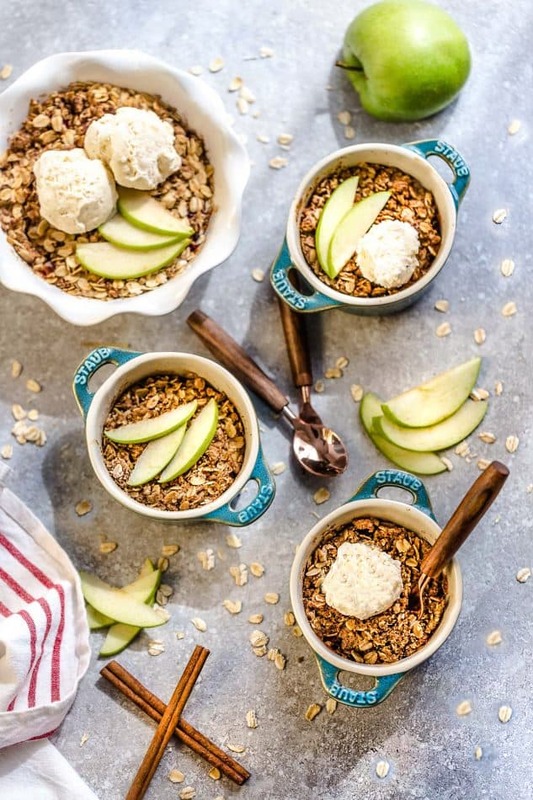 Apple Crisp – the perfect easy and lightened up dessert for fall. 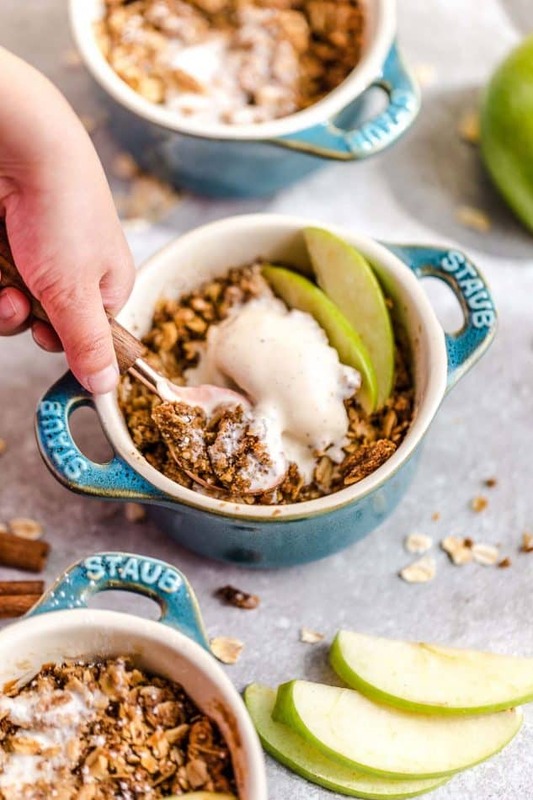 Best of all, this simple fruit crisp is made in single-sized servings with tender apples and a cinnamon oatmeal streusel. When it comes to dessert, fruit crisps are hands down one of my favorites these days. They are seriously one of the easiest things to make – and probably one of the few desserts I am always willing to turn on the oven for. What I love about crisps is that you can use any combination of fruit you like. For me, nothing is more comforting than a warm apple crisp fresh out of the oven on a cool autumn afternoon. These mini apple crisps make them great for a baby shower, potlucks, family gatherings or any time you’re craving something sweet. I also decided to keep these apple crisps refined sugar free by sweetening them up with coconut sugar. And instead of butter, they are made with coconut oil and are completely gluten-free. If you prefer to make this recipe the classic way, feel free to use brown sugar and / or butter instead. 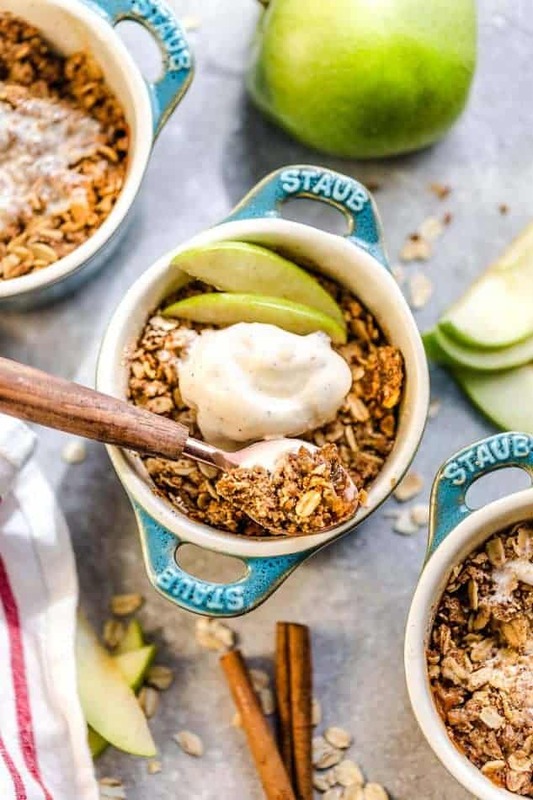 The cinnamon oat crumble still bakes up all beautiful, golden and crispy, and is the perfect complement to the sweet apple filling. 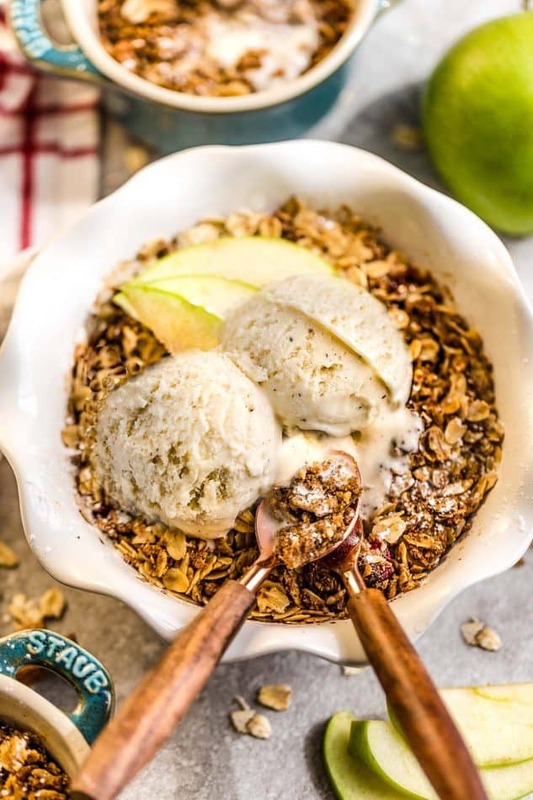 Enjoy this apple crisp on its own or with a scoop of frozen yogurt or vanilla ice cream. Either way you choose, these would make any day better whether you’re celebrating anything or not! Preheat the oven to 350 degrees Fahrenheit. Place six (8) ounce ramekins and place on a baking sheet. Grease with coconut oil or baking spray. (Alternatively, you can also make this in a greased 8x8 baking pan). Set aside. 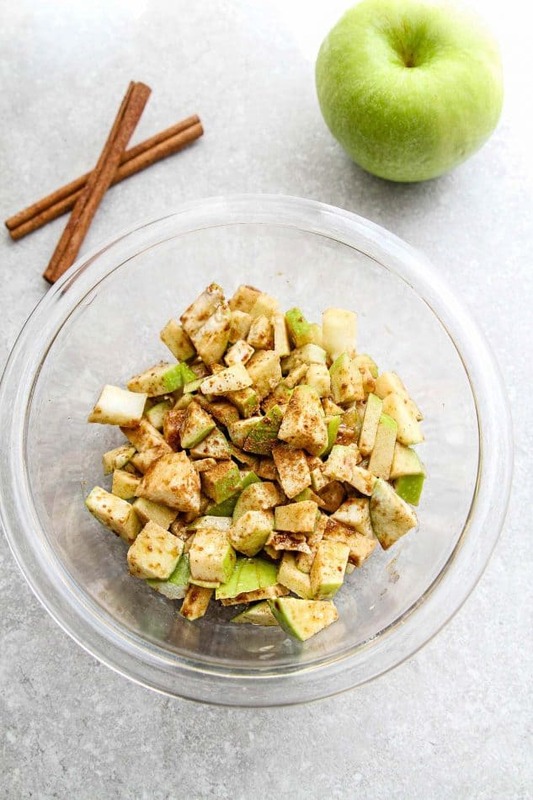 To prepare the filling: In a large mixing bowl, toss together the apples, sugar, arrowroot starch, vanilla extract and cinnamon until thoroughly combined. Divide evenly into ramekins or spread into baking pan. To prepare the topping: Wipe down the same mixing bowl and toss in the oats, oat flour, sugar, cinnamon and salt. Add coconut oil and use your fingers to combine mixture until it's moist and crumbly. Spoon the mixture evenly among the ramekins covering the filling. Bake in preheated oven for about 25-30 minutes, or until the filling is bubbling around the edges and the top is lightly golden. Remove from oven and allow the crisp to rest for 5 to 10 minutes. Serve with a scoop of plain yogurt, frozen yogurt or vanilla ice cream. Don’t forget to stop by and check out the other recipes from all of the bloggers hosting this virtual baby shower too!